Q: To the best of your knowledge how much will you receive when you retire? 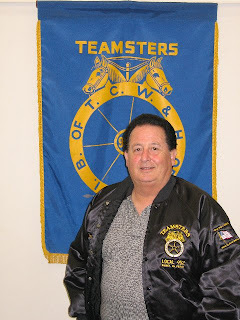 A: When I retire after 33 years of being a proud Teamster I will receive 4100 dollars per month. Q: Is that 4100 dollars per month include your Teamster Pension, 401k, and social security? A: No, that 4100 dollars per month is just my Teamsters Pension. If I include my 401k and social security with my pension then I will receive 6100 dollars per month. Q: How comfortable are you with your retirement? A: I am tremendously comfortable with my retirement. God Bless the International Brotherhood of Teamsters for making it happen with the benefits they bargained for over the years. I am grateful for my Teamsters Pension you can't live on just social security and a 401k. The 401k goes up and down at the whim of the stock market. Sure the 401k helps, but you can't make future plans on a hope that the stock market will do well and social security doesn't get privatized. I firmly believe that with a Union contract I have secured my future. Q: What is your opinion on the International Brotherhood of Teamsters and their impact on the American workforce? A: If it weren't for the International Brotherhood of Teamsters there would be a super Wal-Mart or a group of companies treating their employees terribly like Fedex. At non-union companies like Fedex there is no Union contract which means no grievance procedure which places hard working employees at the mercy of CEOs who change policy at every whim to suit the company's needs. Q: Are Unions necessary to obtain a decent retirement package? A: Absolutely. That's what a Union contract is for. You can't deal with a 401k alone for a retirement plan. I have the Western Conference Teamsters Pension and a 401k. With the International Brotherhood of Teamsters I have the total package. They have blessed my life and they have enriched my future. Fedex has put the money that they would've paid their employees in their own pockets at the expense of hard working employees who deserve retiree medical and the best pension out there the Western Conference Teamsters Pension. I am confident with a Teamsters Pension I will be able to retire comfortably with peace. Q: Are you confident you will not have to return to work once you retire because of financial hardship? A: Yes, I am confident I will not have to return to work once I retire because there will be no reason for me to return to work. I have more then a substantial amount of income to live the way I am accustomed to right now. I don't have to spend my time worrying about where the money is going to come from because I am guaranteed the money in my Teamsters Pension. Plus I have retiree medical which was negotiated in the contract by the Teamsters who safeguarded my future. When the Teamsters go to the bargaining table they bring the most important voice to the table. The voice of the workers. Q: What do you think of Joe Nuno and the various organizing committees organizing fedex thoughout Southern California? A: I think it is fantastic to see the Fedex Teamsters involved and persistent to change the environment in their workplace. The Fedex Teamsters have a great and devoted following. It takes a lot to stand up to the constant harassment from the Fedex management and gain a voice in the workplace forming a union. There's a right way and a wrong way to live life and I am encouraged to see people fighting for their rights. I am honored to stand with you guys. It is also very encouraging to see Joey Nuno with his father, Joe Nuno. It is very touching to see a father bring up his son with a deep passion for other people's rights putting other people's needs above his own. I am pleased to see the bright future joined between the International Brotherhood of Teamsters and Fedex. Fedex Teamsters Chronicles Interview with Cliff Armstrong. Cliff is a future Teamster. He is an organizer with the Fedex Teamsters in Fontana Service Center driving Pick Up and Delivery. He is 54 years old and he has 30 years of service with Fedex Freight/Viking Freight. A: I will receive $1100 per month with my Fedex pension. With social security I will receive $1300 per month. So a total of $2400 dollars per month. You know after 30 years of service the Fedex Pension plan stops growing for me. This simply means I won't get one penny more after 30 years with the Fedex pension, but with a teamsters Pension I will keep growing my pension until I retire. Plus I won't have any medical insurance to speak of with fedex's pension, but the Teamsters have retiree medical something fedex is too cheap to give to their employees. I guess fedex just doesn't care when the employees retire if the employees have medical insurance or not. Q: How comfortable are you with your retirement plan from Fedex? A: I'm not comfortable with the Fedex pension at all. New pension or old pension is all the same. A complete fantasy. There is no medical plan to fall back on. I don't know what I'll do for medical insurance when I retire. It's going to be hard for me to live on that 1100 dollar a month pension Fedex is going to give me. Q: What do you think about the NEW revamped pension plan Fedex is putting out there now that people are unionizing? A: With the new pension plan, with my age and years of service I think this new plan stinks. The Fedex management is trying to simulate the Teamsters pension in a much cheaper version which will hurt employees in the long run. It's similar to the Teamsters golden 80's which combines years with length of service. I will get 36,000 dollars from this pension plan that's it. This amount with the new Fedex pension plan will be drawn off of the Treasury Rate. Let's say an employee, for sake of the conversation we will call the person Bugsy, would get 50,000 dollars after ten years of service. So say Bugsy works 20 years and gets 100,000 dollars. Bugsy then after taxes on that money which is drawn in a lump sum gets 75,000 dollars. This 75,000 dollars will only last Bugsy for 1 or 2 years tops. This is a weak retirement. Both Fedex pensions are pathetic and I feel the new pension plan is even more pathetic than the old one. The Fedex Corporation stresses a 401k plan, but the 401k plan goes up and down like a yo-yo. So you have to ask yourself is this plan secure for you and your future? Or are you going to rely on a yo-yo for your retirement? Is the 401k going to be up or down? Q: What do you think of the so-called retirement estimator being passed around by the management at Fedex Freight? A: I think it is like Disneyland. The retirement estimator is something out of fantasy land. It is pure nonsense. It is like setting up your retirement using a crystal ball. I have worked for fedex freight/Viking for 30 tough years and I feel very insulted by this retirement estimator. Everything about the old pension was a secret for the last 30 years, but now since there is a mass interest in unionizing the company is scared a union will come in. I feel as if the pension plan should have now and always have been public information for all employees to look at anytime they want to. I don't understand all of the secrecy and lies from the management. Q: What would be a direct impact of unionizing Fedex Freight? A: With a union the benefits package would be included in the union dues which means we as employees would pay less in benefits per month. The dues are 2 and a half times what we make per hour. With Fedex you have Fred Smith and a lot of corporate greed going on with the employees having to bear the brunt of paying more for health insurance, a terrible pension plan, and a fantastical retirement scheme involving a 401k. What a scam. The Fedex management is just taking more and more advantage of the employees trying to get a lot paying for very little. Q: Do you think a Union would be good or bad for Fedex Freight? A: I think that the Teamsters Union would be great for Fedex Freight. We will have an enhanced medical plan with little to no co-pay for medical visits and prescriptions. I will have a good retirement and favoritism till soon be eliminated with a union. If the company continues to try and cut my overtime the union will step in and demand that my seniority be respected. It is about respect. Also, I will have good backup if the company tries to write me up for no good reason. This is called a grievance procedure not a sham that is done now with a gestapo type management berating employees. Q: What kind of future do you see for the Fedex Teamsters unionizing Fedex Freight? A: I think the Fedex Teamsters have a very positive future. I see a binding Teamsters Union contract in our future. No more empty company promises. Fedex Freight employees will make more money per hour with better benefits, but the company will also have a lower turnover rate saving money and keeping employees working. Fedex Freight tells us we have the best company, but Fedex doesn't pay us or treat us like the best.You have to ask yourself whats wrong with this picture? Retirement is the point where a person stops employment completely. A person may also semi-retire and keep some sort of retirement job, out of choice rather than necessity. This usually happens upon reaching a determined age, when physical conditions don't allow the person to work any more (by illness or accident), or even for personal choice (usually in the presence of an adequate pension or personal savings). The retirement with a pension is considered a right of the worker in many societies, and hard ideological, social, cultural and political battles have been fought over whether this is a right or not. In many western countries this right is mentioned in national constitutions. Retirement is also sports jargon for the situation where a team (for example in Football) decides never again to issue the jersey number of a retired or deceased player, as a token of honor. A pension is a steady income given to a person (usually after retirement). Pensions are typically payments made in the form of a guaranteed annuity to a retired or disabled employee. Some retirement plan (or superannuation) designs accumulate a cash balance (through a variety of mechanisms) that a retiree can draw upon at retirement, rather than promising annuity payments. These are often also called pensions. In either case, a pension created by an employer for the benefit of an employee is commonly referred to as an occupational or employer pension. Labor unions, the government, or other organizations may also fund pensions. The 401(k) plan is a type of employer-sponsored defined contribution retirement plan under section 401(k) of the Internal Revenue Code (26 U.S.C. § 401(k)) in the United States, and some other countries. A 401(k) plan allows a worker to save for retirement while deferring income taxes on the saved money and earnings until withdrawal. The employee elects to have a portion of his or her wage paid directly, or "deferred", into his or her 401(k) account. In participant-directed plans (the most common option), the employee can select from a number of investment options, usually an assortment of mutual funds that emphasize stocks, bonds, money market investments, or some mix of the above. Many companies' 401(k) plans also offer the option to purchase the company's stock. The employee can generally re-allocate money among these investment choices at any time. In the less common trustee-directed 401(k) plans, the employer appoints trustees who decide how the plan's assets will be invested. Some assets in 401(k) plans are tax deferred. Before the January 1, 2006 effective date of the designated Roth account provisions, all 401(k) contributions were on a pre-tax basis (i.e., no income tax is withheld on the income in the year it is contributed), and the contributions and growth on them are not taxed until the money is withdrawn. With the enactment of the Roth provisions, participants in 401(k) plans that have the proper amendments can allocate some or all of their contributions to a separate designated Roth account, commonly known as a Roth 401(k). Qualified distributions from a designated Roth account are tax free, while contributions to them are on an after-tax basis (i.e., income tax is paid or withheld on the income in the year contributed). In addition to Roth and pre-tax contributions, some participants may have after-tax contributions in their 401(k) accounts. The after-tax contributions are treated as after-tax basis and may be withdrawn without tax. The growth on after-tax amounts not in a designated Roth account are taxed as ordinary income. In the United States, the legal definition of a defined contribution plan is a plan providing for an individual account for each participant, and for benefits based solely on the amount contributed to the account, plus or minus income, gains, expenses and losses allocated to the account (see 26 U.S.C. § 414(i)). Plan contributions are paid into an individual account for each member. The contributions are invested, for example in the stock market, and the returns on the investment (which may be positive or negative) are credited to the individual's account. On retirement, the member's account is used to provide retirement benefits, often through the purchase of an annuity which provides a regular income. Defined contribution plans have become more widespread all over the world in recent years, and are now the dominant form of plan in the private sector in many countries. For example, the number of defined benefit plans in the US has been steadily declining, as more and more employers see the large pension contributions as a large expense that they can avoid by disbanding the plan and instead offering a defined contribution plan. The new1 Fedex pension plan is absolute garbage. I think it is being used as a smoke screen to attempt to divert attention away from wanting a UNION. I stand to make less with this new pension plan and Fedex management wants me to work till I am 85 under this new pension. This is really bad. great work guys on the interviews. Those of us at fedxmx.blogspot.com are right behind you fighting for our futures. Our time is coming and we will all be teamsters real soon and then we will get our fair share and thats all we are asking for.